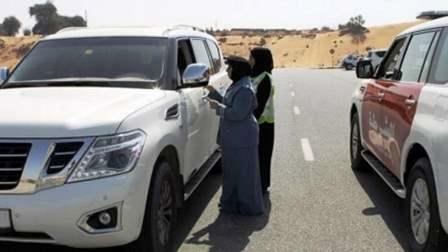 The Ras Al Khaimah Police have launched the first female-only traffic patrols on the roads of the northern emirate. The two patrols are concerned with specific missions, according to Major General Ali Abdullah bin Alwan Al Nuaimi, Commander-in-Chief of the RAK Police. "Boosting and ensuring traffic flow on the roads of the emirate are part of their duties." They are also tasked with handling the vehicles driven by women, he added. "They also investigate the traffic accidents where one or both parties are women and children." The female-only traffic patrols have started operation on Saturday, March 24, he disclosed. "The two patrols are run by Emirati nationals who have gone through an intensive training programme." The quantum leap is in line with the RAK Police tireless effort to empower Emirati women, and boost her role in building the nation, Maj-Gen Bin Alwan underlined. "This is also in pursuance with the directives of the prudent leadership." Col Ahmed Saeed Al Sam Al Naqbi, acting director of the traffic and patrols department, RAK Police, said the 'women patrols' will be deployed at night. "The two women-only patrols start their duty from 8 pm to 2 am on every Thursday, Friday, and Saturday." Wafaa Saqr, an Egyptian teacher, said the pioneering move reflects the RAK police effort to empower women. "It is so convenient for any woman involved in a traffic accident to have the issue handled by a woman officer." Start-ups taking part in the competition will be evaluated by a panel of experts, based on criteria such as creativity, impact on society, sustainability, scalability, feasibility, and prospects for commercialisation. Winners from each of the eight cities will be awarded $10,000 (Dh36,700), as well as a chance to compete for the $100,000 grand prize at the final event, taking place in Dubai, on the sidelines of the World Government Summit in February 2019. Winners will also have the opportunity to collaborate with their governments to implement their technological solutions, and will be invited to participate in a 90-day business incubator programme in Dubai’s Area 2071.